Originally trained as a scholar of British Romanticism, Ted Underwood now works across the whole period from the eighteenth century to the present—focusing especially on questions that benefit from the perspective of a long timeline. He teaches in the School of Information Sciences as well as the English Department at the University of Illinois, Urbana-Champaign, and has recently completed a book, Distant Horizons, about the new historical perspectives opened up by machine learning and digital libraries. His research interests include: distant reading, British romanticism, history of science, theories of historicism, institutional history and sociology of literary study and computational social science and text mining more generally. Underwood, Ted. “A Genealogy of Distant Reading.” Digital Humanities Quarterly 11, no. 2 (2017). Underwood, Ted. “The Life Cycles of Genres.” Cultural Analytics 23 (2016). English, James F. and Underwood, Ted. “Shifting Scales: Between Literature and Social Science.” Modern Language Quarterly 77, no. 3 (2016): 277-95. Underwood, Ted. 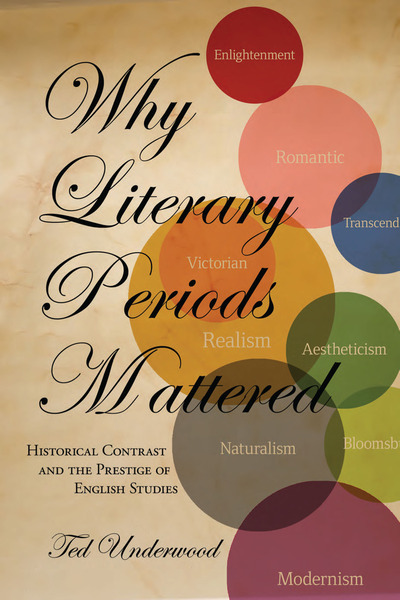 Why Literary Periods Mattered: Historical Contrast and the Prestige of English Studies. Stanford, CA: Stanford University Press, 2013. Underwood, Ted. The Work of the Sun: Literature, Science, and Political Economy, 1760–1860. New York: Palgrave, 2005.